we teach music to corporate employees to remove their stress. HR department can plan innovative stress remover programmes with us. The piano is used across genres of music for solo and ensemble performances and for accompaniment and composition. 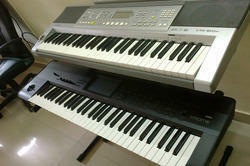 The instrument can be learnt by young and old with equal ease under the guidance of a piano teacher. Customised to the need of each child OverviewWe introduce them to the world of music first hand. Our focus lies on generating and sustaining musical interest in your child.